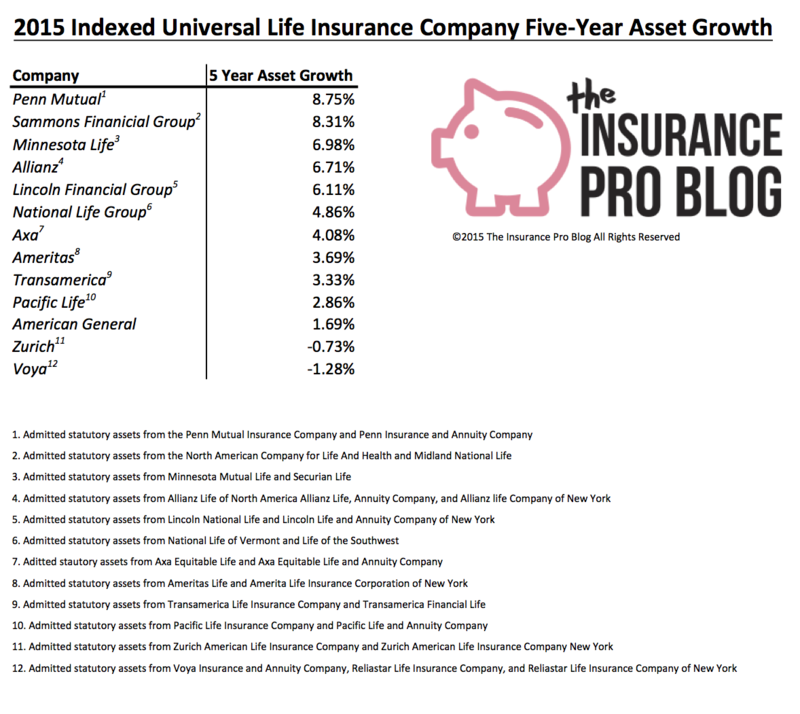 Insurance company asset growth is a measure of overall company success in accumulating assets. It’s a metric that certainly indicates positivity when the trend is upwards, but there are a few nuances that we have to keep in mind before ambitiously declaring a winner. Insurers can accumulate assets either through the new business process (i.e. selling new policies and collecting more premiums) or through superlative investment performance. In either case, an upward trend is almost always favorable, the difficulty comes in trying to determine how much of an upward trend matters when looking at results from multiple life insurers. Admitted assets refers to the value of assets held by a life insurer under insurance statutory accounting principles (SAP or sometimes SSAP for Standard Statutory Accounting Principles). This differs from valuation accounting rules employed by the much more ubiquitous GAAP (Generally Accepted Accounting Principles) in a few key ways. Without belaboring the differences, the major divergence between GAAP and SAP for our purposes today is the timed nature of value. GAAP being much more cash flow/operationally focused allows for a greater degree of theoretical valuation (i.e. not just the value of something today, but it’s likely value into the future) while SAP is only concerned with the current liquidation value of an asset (i.e. what do you receive today if you sold the asset). We used admitted assets under Statutory Accounting Principles reported by insurers in state filings to calculate the five year compound annual growth rate of admitted assets. Insurers that achieved growth results in excess of 6% in the last five years show the most impressive performance. Penn Mutual and the Sammon’s Financial Group (i.e. Midland National and North American has shown the most impressive results exceeding 8% compound growth over the last five years. It’s also important to note the above 6% growth achieved by Lincoln Financial Group and Allianz. We find this noteworthy due to their size and current market penetration (i.e. they represent some of the largest life insurers by assets in the group and as such their growth can be somewhat more difficult). The negative growth results from Voya and Zurich are interesting and not particularly positive. In an effort not to sound alarmist we’ll note that these two insurers regressed minimally over the past five years and both remain financially stable and without serious concern of default.